Synergy 17 - Home - Your source for all your garment decorating equipment and supplies. Thank you for visiting our website. Synergy 17 was formed to help people get started with their new business and to bring new services to existing businesses. Our number one priority is customer service and to ensure our customers get the right equipment for the right job. If you ever need help or have any questions, please feel free to contact us anytime. Be sure to subscribe to our YouTube channel to watch our tutorials. 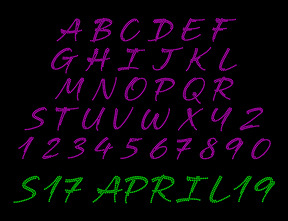 If you missed the Font of the Month Deal for April, it is now available in the storefront. You can click on the font image to go to the webstore. If you missed the Font of the Month Deal for March, it is now available in the storefront. You can click on the font image to go to the webstore. 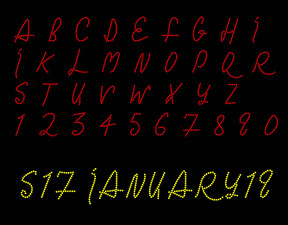 If you missed the Font of the Month Deal for January and February, they are now available in the storefront. You can click on the font image to go to the webstore. 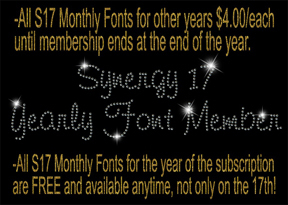 We have created an annual S17 Monthly Font membership. 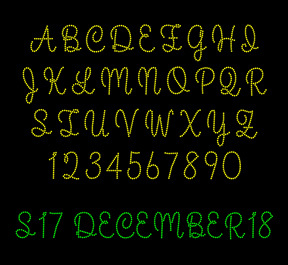 There is still a monthly special where the font is $4.00 and you get a free design on the 17th, but if you are a member, you get both the font and design free anytime of the year of the membership. There are other perks as well. Read more about the membership by clicking the image below. I had another great time this year teaching and sharing new tips and tricks with the class. It's time to get back to work. We are taking orders once more and shipping starts this Monday(1/28/19). 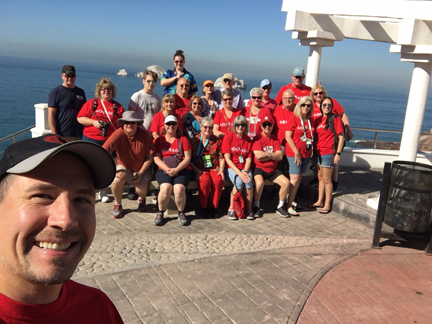 It's always a fun time with this group! I'm heading out to the ISS Long Beach show, and then on the Garment Decorating Cruise this Saturday(1/19) and returning on Sunday(1/27). Synergy 17 will be semi-closed during that time. There will be a delay in shipping on some items from California, but the webstore will continue to be open. All downloads, Heat Presses, Cutters, and some HTV 5yds or more will still go out. 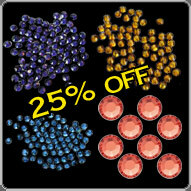 Supplies, rhinestones, foils, TexTack, and smaller amounts of HTV will ship on Monday (1/28). I'll have spotty internet access while I'm out, but I'll do my best to stay in contact and respond to PM, emails, etc. Soo...if you need anything shipped soon, please order by this Thursday(1/17) evening so it can ship out Friday morning, before I head out. Thanks! If you missed the Free Font of the Month for December, it's now available in the storefront. You can click on the font image to go to the webstore. 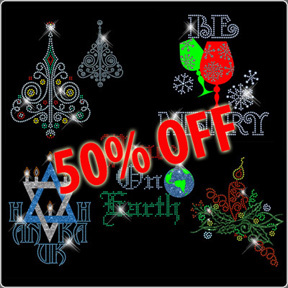 From today until the end of the year, you can get all Christmas designs for 50% off. If you missed the Free Font of the Month for November, it's now available in the storefront. You can click on the font image to go to the webstore. From today until the end of the month, you can get all Halloween designs for 50% off. 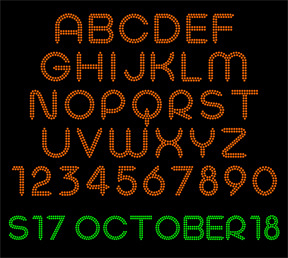 If you missed the Free Font of the Month for October, it's now available in the storefront. You can click on the font image to go to the webstore. If you missed the Free Font of the Month for September, it's now available in the storefront. You can click on the font image to go to the webstore. 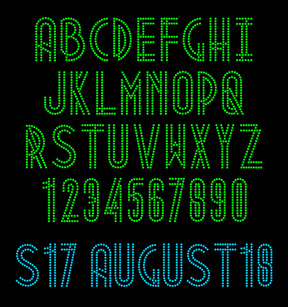 If you missed the Free Font of the Month for August, it's now available in the storefront. You can click on the font image to go to the webstore. 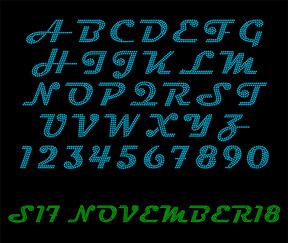 All S17 Monthly Fonts are on sale. 35% off for invidual fonts and 20% off the yearly packs. Click on the image below. 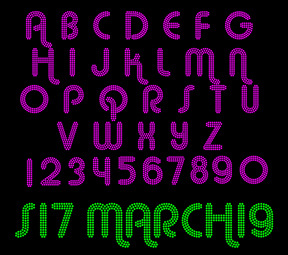 At Synergy 17, we want to thank all our fans and customers by offering a brand new pre-stoned rhinestone font every month on the 17th which will be downloadable for FREE for 24 hours. 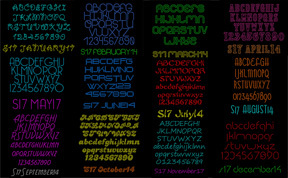 After 24 hours, that font will become a for sale font like the rest of them. Don't forget to set your calendar reminders to visit us on the 17th of every month! Be sure to check back often for other specials, too. Click here for the free font. We've added 6 new colors to the S17 1-Step Foil line of HTV. 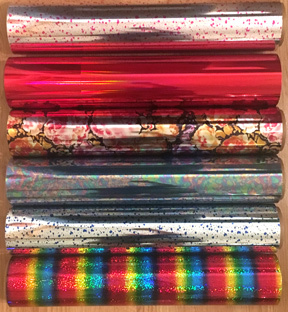 We now have Speckle Blue, Speckle Pink, Roses, Holographic Red, Rainbow Confetti, and Oil Slick for a total of 33 colors. Click on the image below to see them all. 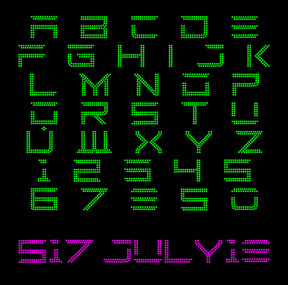 If you missed the Free Font of the Month for July, it's now available in the storefront. You can click on the font image to go to the webstore. It's time to get back to work. We are taking orders once more and shipping starts this Monday(6/18/8). 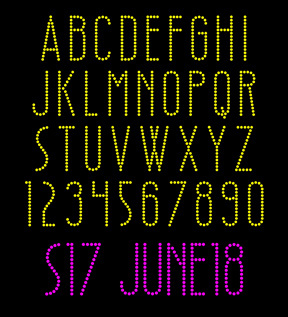 If you missed the Free Font of the Month for June, it's now available in the storefront. You can click on the font image to go to the webstore. 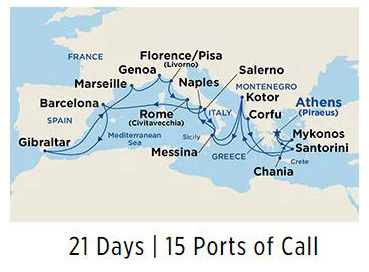 I'm heading out on vacation this Wednesday(5/23) and returning on Sunday(6/17). Synergy 17 will be semi-closed during that time. There will be a delay in shipping on some items from California, but the webstore will continue to be open. All downloads, Heat Presses, Cutters, and some HTV 5yds or more may still go out(Email if you have any questions before you order.) 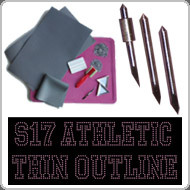 Supplies, rhinestones, foils, TexTack, and smaller amounts of HTV will ship on Monday (6/18). I'll have spotty internet access while I'm out, but I'll do my best to stay in contact and respond to PM, emails, etc. Soo...if you need anything shipped soon, please order by this Tuesday(5/22) evening so it can ship out Wednesday morning, before I head out. Thanks! 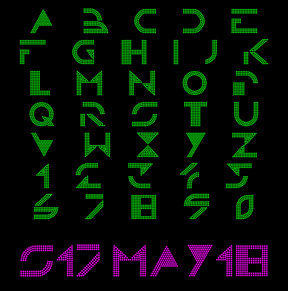 If you missed the Free Font of the Month for May, it's now available in the storefront. You can click on the font image to go to the webstore. See archived news on the news page.